There are about 50 species known of the hardy herbaceous perennial Heuchera. Heuchera belongs to the same Saxifragaceae family like Astilbe and Bergenia. The name Heuchera has been derived from Mr. Johann Heinrich von Heucher. Mr. Von Heucher was born in 1677 in the Austrian Capital, Vienna and passed away in the year 1747 in the German city Wittenberg. Johann Heinrich’s record of service is very impressive. He was a medical practitioner; a Professor in the botany; General Director of the Botanical Garden at Wittenberg and the personal physician of King August the 2nd of Saxony. He also was the Author of several books about botany. Heuchera is native in North West America; some are found in the mountains of Mexico. Heuchera is a valuable plant because of its strong long lasting ground covering leaves and elegant flower stems. Heucherais not only beautiful in the border edge or as a ground covering plant on the open spots between the shrubs but it shows up well in large groups, planted in borders, so an optimal plant for City greening. Heuchera prefers moisty; humus-rich soil. In case Heuchera is planted in heavy clay soil, peat should be added to the soil before planting. Heuchera americana which means…originating from America or found for the first time in America. Syn: Heuchera lucida which means: gleaming; bright; glossy. For the readers it might be interesting to know that this part of the world has been named after Amerigo Vespucci, born in Florence in 1451. He passed away in 1512 in Sevilla. Amerigo was a nautical seaman and in accordance with the custom of his age he changed his name into Latin: Americus Vespucius. He became more famous than Columbus, because of his travel books. Heuchera caespitosa or cespitosa(Tufted Alumroot)…derives from the Latin word caespes or caespitis which means: sward-producing. Heuchera cylindrica….cilindrish; it is native in North America and mostly grown because its dark green and white marbled leaves. Heuchera cylindrical Greenfinch is an English variety. it has creamy-green flowers and is suitable for the production of fresh cut flowers. Heuchera parishii; Mill Creek Alumroot. parishii is the genitive of the Latin name Parishius…from Mr. Ch.S. Pollock Parish. This English gentleman, born in 1822 inCalcutta; India graduated from the OxfordUniversity in the UK as a clergyman. He became a pastor from 1852 till 1878 in the Birma where he as a hobby, collected many plants, in particular Orchids. Heuchera parishii is named in honour of Mr. Parish. He definitely returned back to the UK in 1878. He passed away in 1897 in Roughmoor located in the English province Somerset. Heuchera pilossisima Seaside Allumroot. Pilossissima is the superlative of the Latin word pilösus which means: very densely haired. Heuchera sanguinea Coral Bells. Sanguinea comes from the Latin name sanguinis which means: blood; bloody; blood-red. The variety is native in Arizona and New Mexico(USA) Heuchera sanguinea is a typical specie, used by breeders as a parent. Well-known varieties are: Bressingham hybrids; Leuchtkäfer and Sioux Falls. Heuchera villosa. Hairy Alumtoot. Villosa derives from the Latin word villósus which means: soft long hair, or soft longhairy. The Heuchera nursery of Klaas and Leon Klaassens. In the east Dutch province Drente, close to the German border and near to the Dutch city Assen, the village Hooghalen is situated. In this small picturesque village you may find the nursery of Klaas and Leon Klaassens. When entering the nursery, the warm coloured fields with Heuchera calls one a festive welcome and it is hardly to believe that this well established and well run nursery has been set up by someone having not any education and training on gardening. Mr. Klaas Klaassens, graduated in mechanical engineering at the TechnicalHigh School, became an official surveyor at the Land Registry, a semi Governmental Organisation. As he did not want to spoil whole his life, sitting behind the windows, in front of his computer desk day after day,Klaas decided to start a nursery. In 1998 he bought 8 Ha of land. Klaas got in touch by the world-wide and well known hardy perennial specialist, Mr. Luc Klinkhamer. When Luc acknowledged Klaas , being a gardener having so-called “green fingers”, he infected Klaas with the Heuchera virus and since then Klaas could not get rid of it and became a passionate and specialised Heuchera grower. Klaas joined Luc’s New Plants Green Team to be sure that he always will be the first when a new variety comes into production and trade. Klaas runs the nursery in partnership with his wife Jannie and their son Leon. Leon is a Certified Nurseryman of the SecondaryAgriculturalCollege. Producing top-quality plants is somethingwhere Klaas and Leon feel very strongly about. In principle, it is not that difficult to grow Heuchera, Klaas says, but they do not like if the soil is too wet. The Otiorhynchus ovatus commonly known as the strawberry crown girdler(root weevil) also has discovered that Heuchera is a tasty plant. It drops its eggs in the plants and the white grub consumes the roots and that’s why the plants die down. In the nursery, Klaascontrols this problem chemically in June; July and August, so that his plants always are free of this “non-invited” guest. The main Heuchera varieties, Klaas grow are from the famous French breeder, Thierry Delabroye. His range includes the latest introductions KASSANDRA; DARK SECRETS and TARA, but, according to Klaas, some Terra Nova varieties, still are valuable and worth to produce. It are the varieties: Chocolate Ruffles; Lime Ricky; Marmelade; Midnight Rose; Obsidian; Peach Flambé; Plum Pudding and Sparkling Burgundy. Klaas also advises to buy undivided Heuchera plants. The price is higher, he says, but the chance of survival is much higher. Another recommendation, based on experience, is to plant all the light leaves Heuchera like Citronelle; Lime Ricky; Tiramisu and Pistache on a shady spot in the garden. These varieties do not bear the heat or too much sunlight. Besides Heuchera, Klaas also grows the marvellous Thalictrum Splendide as well as the better varieties of Pulmonaria. The story of a French Heuchera breeder. In the surroundings of the French city Lille, a very small settlement, named Hantay, is located. If the world-famous hardy perennial breeder Thierry Delabroye; his wife Sandrine and his daughter Perinne should not live there, one even would deny that this settlement in the French countryside, exists! However, “the footsteps” of many breeders and directors of leading companies from throughout the world, may be found there. It all began in the early eighties of last century. After having finishedtheirry delabroye the branch of vegetable growing at the AgriculturalCollege, Thierry had to fulfil his obligation in the military service. 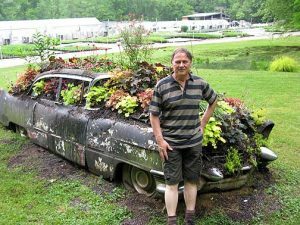 In 1985 he started his own vegetable farm. But he did not grow vegetables for many years. What happened?? In the nineties of last century, Thierry met with Elizabeth Strangman at Wasfield Nurseries, United Kingdom, the famous Helleborus and shaded plants specialist and, from that very moment on, he switched over. He began to study many books about hardy perennials, visited plenty of nurseries in the UK and when reading“THE PLANTFINDER” issued annually by the Royal Horticultural Society, Thierry for the first time in his life got impressed. Thousands of plants were listed; so many possibilities; sucha rich world of plants and then……looking at the beetroots; the lettuce; the garlic; the carrots and the cabbage on his fields, he actually became conscious in what a poor world he lived. The window to the future was opened and what he saw was a wide panorama of new possibilities. To build up his own range, he bought seeds, offered by companies, dealing in hardy perennial seeds and started collecting botanic species of hardy perennials as Thierry says: they are the strongest by nature and therefore more suitable for making a start in breeding. Nowadays, Thierry is a world famous breeder of Helleborus. It, really is hardly to believe what Thierry has reached in this field. The eye-catching new colours and shapes both in single and double flowering types are so unique that even the Queen of Belgium every year buys new varieties from him. During the open days , annually held in January an February it is a comings and goings of visitors from all over the world. Besides the Helleborus, Thierry breeds other types of plants as well. One of his top introductions for example, is Geranium Sandrine, named after his wife. The purple violet flowers are double the size of a 2 euro coin. In the Summer of 2008 a new Geranium variety will be introduced, named after the French movie star Catherine Deneuve. A part of the royalties to be paid, will be spend for a good cause. A Tradescantia variety got the name of his daughter Perinne. Thierry’s versatility in breeding is proverbial in the meantime. In the scope of this article, I am not going to describe his breeding work of Corydalis; Epimedium; Leucanthemum; Podophyllum and Thalictrum as I want to write about his success in breeding Heuchera. Thierry’s first introduction was the orange/yellow Heuchera Caramel. At that time, this colour was so special, the best yellow one so far, that some people suspected him of crossing the Terra Nova variety Amber Waves with a villosa type. This accusation easily is refutable as Heuchera Amber Waves is a sterile variety and never ever will produce any seed. For his Heuchera breeding program, Thierry prefers to use Heuchera villosa types. These are much stronger. He made a start with the very old French variety Gloire d ‘Orleans(Lemoine) and some species. Heuchera Gloire d ‘Orleans is famous for its nice green silvery foliage and rich flowering characteristic. The pink flowers normally appear in early Spring but to his great surprise and good luck, Heuchera Gloire d ‘Orleans re-bloomed once. 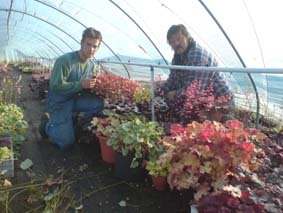 Thierry, immediately took the opportunity to make a crossing between this single re-blooming stem and Heuchera Caramel. The results were fantastic and surpassed his wildest expectations. A number of top colours occurred under which the variety Tiramisu, introduced in 2007, holds an important position. 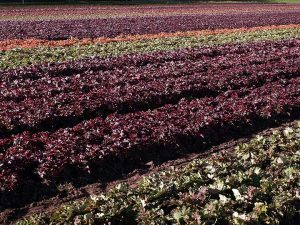 Since Theirry’s first Heuchera introduction Caramel, he introduces each year 2 or 3 new varieties, selected out of thousands of annual seedlings. His motto is: a plant must be a strong, long living plant, otherwise it is no use to introduce it. The following varieties of Heuchera have been introduced by Thierry: BEAUJOLAIS; BROWNIES; CARAMEL; CITRONELLE; CHRISTA; ENCORE; MIRACLE; MOCHA; PINOT GRIS; PINOT NOIR; PISYACHE; TIRAMISU. In late Autumn 2008, the varieties DARK SECRETS; KASSANDRA and TARA are introduced. 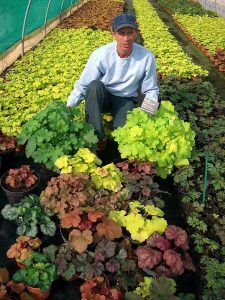 The end is still not in view as Thierry constantly works to complete the range of colours as well as to improve the hardiness of the plants and creating light coloured Heuchera varieties which may bear extreme heat; sunlight and draught. Thierry has one negative habit: he talks too much, but thanks to his wife Sandrine, money is made out of Thierry’s breeding work. Who does not know the “throughout the world” highly esteemed hardy perennial specialist, Mr. Luc Klinkhamer; the only foreign member and Examiner of the luc klinkhamerprestigious ROYAL HORTICULTURE SOCIETY in the United Kingdom? Luc, having a great passion for Heuchera has plenty of Heuchera varieties in his private collection. Of course, Luc is no breeder of profession, but this Springhe found a plant among his seedlings having such a specialcolour that it hardly can be described. It is a black-spotted one, having a silvery white background changing into violet and purple when it matures. Luc is very proud of it and, though Luc strictly has forbidden me to talk or to write about his variety, I want whole the world know how it looks and that it probably will be available in Autumn 2009 / Spring 2010. Luc also presented one plant to Thierry for using it in his breeding program with Heuchera villosa.